Leaving Cambodia behind us today it occurs to me that there’s a pervasive element of the last few weeks that I’ve failed to mention – the smells. Both Vietnam and Cambodia have been redolent in exotic fragrances, and sometimes just plain smelly. The underlying smell throughout has been woodsmoke. There is always something burning whether it is cook fires or just little piles of rubbish at the side of the road. Sometimes it was cloying and overwhelming, other times it was just an ever-present background. Then there was the smell of things rotting. Sometimes it was from the muddy fields, or the mangrove swamps. It is the smell of a hot, humid place; not something you seek out, but not really unpleasant either. Sometimes it was the smell of rotting food or garbage, strong and pungent enough to have you holding your breath to prevent it getting in. Animals featured strongly. The sharp smell of ducks and chickens. The stronger stink from buffalo and cows, and that distinctive heavy smell pigs produce when kept in confined spaces. Every now and again, especially when riding, we’d hit a clean, fresh smell of things growing. The sharp smell of lemongrass, the deeper green of other herbs, the tang of mint; or just the freshness of healthy vegetables. And then there was the cooking, wafts of spices, drifts of cooking meat, breezes full of appetising hints of food. As we kayaked yesterday there was the smell of fish. The locals make fish paste, partly by allowing the fish to ferment and then the smell is strong and distinctive. And of course the rivers have their own distinctive aroma. Over all of this, there was the smell of incense. Roadside shrines, street stalls, little drink shops they all have cans with sticks of incense. Sometimes they are there for religious reasons, often they are there simply to mask the other smells. And now having arrived in Bangkok we’ve already identified a new smell… exhaust fumes. Four hours sleep is not enough, let’s just be clear on that. After our New Year’s celebration, we had to kick into action to check out at 7am and so we weren’t at our sharpest this morning. We flew from Phu Quoc to Ho Chi Minh City where we were supposed to have a six-hour wait for our roughly connecting flight to Siem Reap in Cambodia. The day got better when we managed to get onto a much earlier flight; and positively leapt up in our estimation when we found that the airport had a coffee shop that dispensed Australian-style flat whites. So we were sitting sipping on the coffees when an announcement came over the tannoy asking me to report to staff at gate 18. Off I trotted and reported in, to be told that one of our bags had not passed security because there was a problem and they needed me to open it up. So I was escorted back through immigration, customs and security and taken into a small side room. I was at this point running through a number of less-than-pleasant-I’ve-seen-this-sort-of-thing-in-the-movies-scenarios involving something being planted in our bags, when the nice gentleman asked me if we’d been to the Cu Chi Tunnels, which of course we had. In the pool at Siem Reap. You see when we visited the tunnels Declan went into full souvenir-buying mode and got himself a pen holder in the shape of a fighter jet made from old bullets and bullet casings. When this went through the x-ray machine flashing red lights went off all over the place. After I opened the case, the security guard gingerly removed the offending plane, pointed to the bullets and shook his head in a weary way. The funny thing was that when the nice gentleman pointed to a large bin into which I could deposit the plane – there were at least 20 other planes together with a plethora of other Cu Chi souvenirs in there. I really wonder if the security guards have a side line business selling them back to the Cu Chi vendors. The flight to Cambodia was uneventful, although the famously polite and friendly Cambodians were all obviously somewhere else today. Siem Reap is the only airport we’ve ever been through anywhere in the world that forced the children to go through immigration by themselves. And then there was the guard directing people to various queues by hitting them with a rolled up newspaper. Anyway the greeting was much more friendly at our hotel where we’re breathing a sigh of relief to be contemplating five nights in the same place. Time to get the washing done. The last day of our time in Vietnam and the last day of 2013 started very, very calmly. A leisurely breakfast with copious pancakes for the boys and coffee for Jennifer and me was just what we needed. I should take this opportunity to correct something I said at the start of our time in Vietnam. The fact that there were coffee shops everywhere and Vietnam has a French background mislead me into thinking that Vietnam would be a good place for coffee. It is true that there are coffee shops all over the place, but Vietnamese coffee is an acquired taste. Other than its name it bears little resemblance to anything we’d call coffee back home. That didn’t stop me drinking it of course, but it was always with a faint grimace and a mild sense of disbelief. Anyway, we spent the morning splashing, jumping, swimming, and diving about in the blood-warm sea. 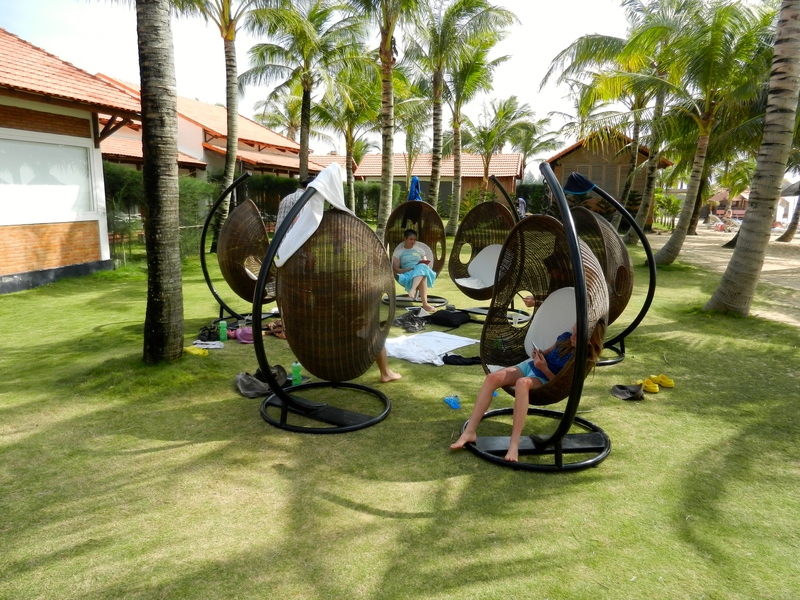 Then we pulled a group of those hanging egg-chairs together into a pod and spent most of the rest for the day chatting, reading, and generally laying about. Much as we’ve loved riding through Vietnam, it was heavenly to have a day without moving. Julie and Kate went off to the spa and came back later looking relaxed after having been massaged and wrapped in vegetables. As the sun set we resorted to gin and tonics and prepared for the New Year’s Gala. The resort’s gala presentation was… unusual. There was a huge spread of food, the centrepiece of which were two Barbie dolls with salmon dresses, something we found hilarious (perhaps that was the G&T’s talking) and the many Russians sitting near us found entrancing. In truth, we actually found the large Russian women sitting at the next table in matching dresses hilarious too, so maybe the G&Ts really were to blame. No, regardless of G&Ts, it was impossible not to both love and fall about in hysterics at the floor show. The entire show was put on by the hotel staff, which was endearing. The MC was dressed in a startling white, shiny suit and had a fingernail-tip grasp of the English language which made things interesting. He also insisted on running through his prepared script even though he was running a good ten minutes behind what was actually going on. Various members of staff went up on the dance floor and sang or danced very sweetly. The kids all spent the evening watching movies in one room and then came and joined us in time for the dancing. And we even got Cal and Dec to dance. Then there were balloons and sparklers all of which had been sparkled and released a good quarter-hour before the MC brought us to that moment in his finale. He didn’t seem to mind. We certainly didn’t mind. The evening finished off with us watching candle-hot-air-lanterns glowing red and floating gently in the sky over the sea. Really the whole thing was an absolute joy thanks to the company. 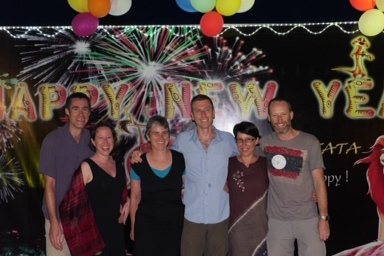 Ray and Kate and Allister and Julie were a wonderful group to see in the New Year with. 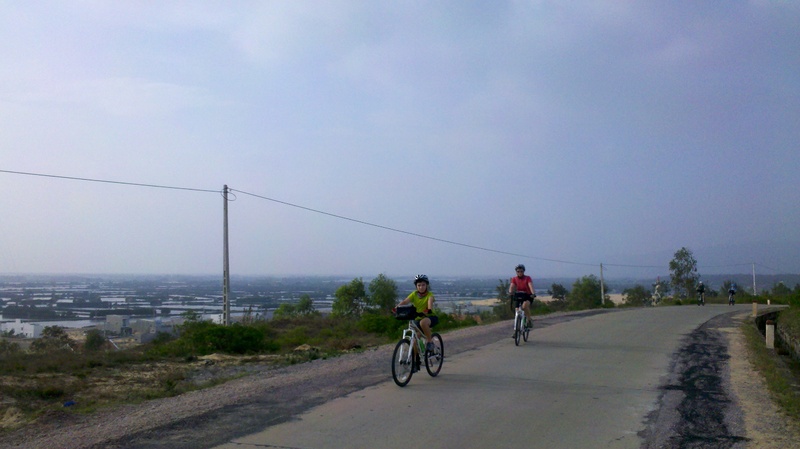 Such a great way to see in the New Year and end our Vietnam cycling tour. With our bikes left behind we said goodbye to our guide and boarded the Superdong IV for our trip out to Phu Quoc island. The Superdong is modelled on the riverboats, it’s long and thin and fast; and almost entirely enclosed. As it bounced its way through rough seas for two and half hours it didn’t take long until people we being sick all over the place. Really the whole trip joins similar boat experiences as something best forgotten about. We finally arrived on Phu Quoc and staggered free of the boat into the waiting arms of the local representative. He loaded us into two minibuses and then proceeded to fill up every available space in the buses with anyone who wanted a lift. Luckily the trip to the Famiana Resort, our home for the next two nights, was not a long one. The Famiana Resort is very new and very pleasant. We had a lovely afternoon splashing about in the Gulf of Thailand’s warm waters and playing with the huge inflatables moored just offshore. As the sun went down the adults sipped gin and tonics while the kids once again commenced their never-ending game of hide and seek. Tough life. Rowing to the floating market. For our last day’s riding we awoke in our homestay hut. We were all a bit smelly after perfunctory cold showers amongst the adults and nothing for the kids. It was a lovely place to wake up to a chorus of rooster crows and the sounds of the nearby river coming to life; and what life. We took a small boat the floating markets. The local farmers come out in tiny boats to meet river traders. The traders buy in one spot, then move and sell in another that grows something different. When they are selling, they raise a long pole and hang samples from it as advertising. The river traders live on their boats which makes it even more picturesque. We then started riding atop tiny dykes through rich farm lands growing bananas, jackfruit, mangos and other fruit. After about 15km we came to a Khmer Buddhist temple. The Khmer used to control the whole area but now they are a minority and tend to live together. The temple was the centre of a small complex with a school, farm and houses. All boys have to spend some time in the temple as a novice, before deciding if they want to become a monk. We learnt some things about Buddha, but mostly just drank in the quiet atmosphere. 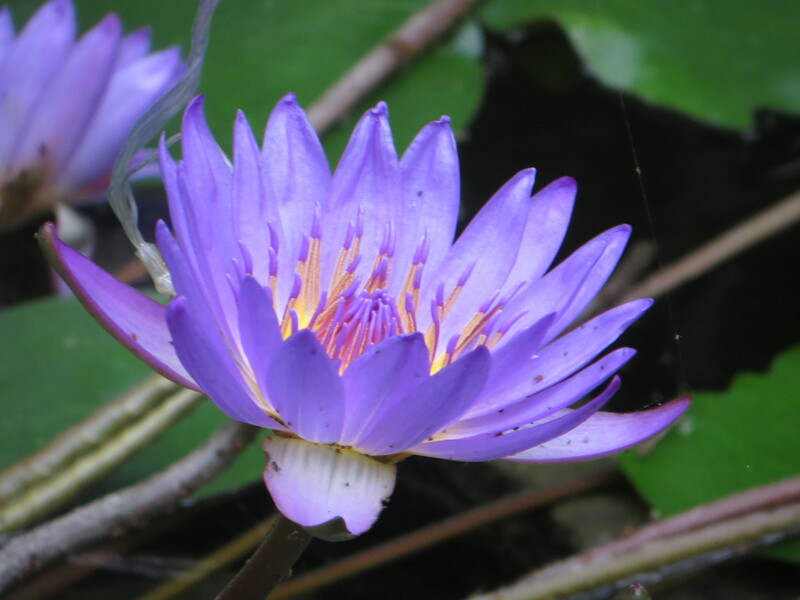 A little bit further on we came to a huge field of lotus flowers, which feature significantly in Buddhism. The field stretched to vanishing distance in a riot of green and pink. We rode on further through the heat. One of the distinctive things about riding in Vietnam has been the range of smells – there’s always an underlying smell of burning wood, often a suspicion of things rotting, occasionally wafts of lemon, orange or banana. Today was particularly pungent thanks to all of the fruit trees growing on the side of thew paths. We were all getting a bit tired and had a couple of minor accidents. Declan came off on an awkward corner and narrowly missed falling into a hedge of cactus. Ray fell off when a motorbike failed to negotiate a bridge and brought several of us to an awkward halt. Overall we’ve been lucky, there have been only minor accidents with just some bruises and scrapes to show for our adventures. After another 60km ride our riding adventures were over and we hopped on a coach to transfer to the South West where we are to catch a boat out to an Island which promises beaches. Riding on dikes between fields. The Mekong Delta looks like a giant has stuck his hands into the rich alluvial sands and scraped a series of deep trenches running towards the sea. The river system, for by this point it is no longer a single river, is absolutely huge – is made up of great wide swathes of brown water. Overloaded boats chug, and they all do chug, along filled with sand, wood, and assorted other goods. We rode over many bridges today and caught several ferries. The bridges are all little hump-backed affairs with small, bicycle-bumping lips at the beginning and end. The ferries are clearly the life-blood of the area, they are practical, functional, chugging beasts. Near most of the ferry ramps there are small clusters of industry. We visited a sawmill where they take logs in and cut them into planks and then in the rest of the workshop create beds and chairs and stools. 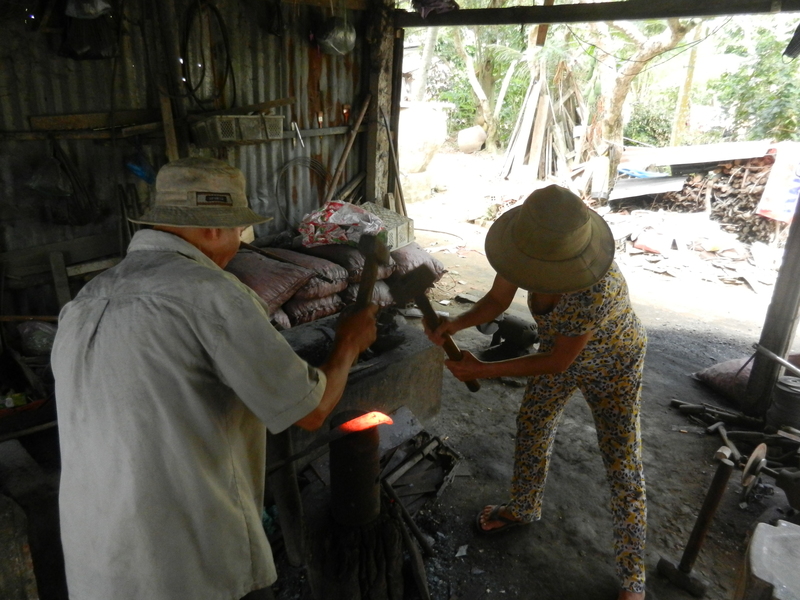 At another stop we watched a husband and wife blacksmithing team in action. The forge was a small concrete plinth with a pile of charcoal on it. The smith would insert the metal into the heart of the embers and use a palm tree whisk to wet the outside of the pile. Once the metal was red-hot he’d withdraw it and put it on a little cylindrical anvil. Then he and his wife would start hitting it, all without exchanging a single world. Our third industry was brick making. 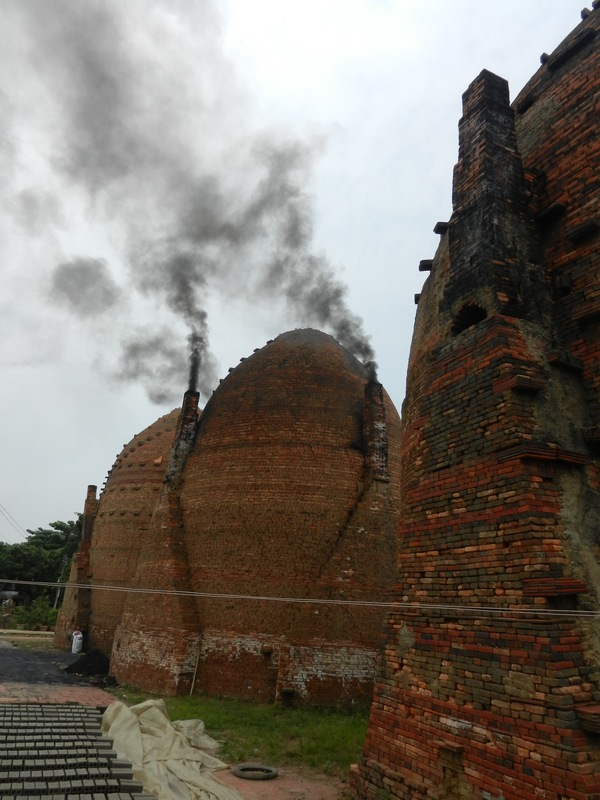 Huge bee-hive kilns use rice husks to fire bricks enormous piles of bricks. The remaining burnt charcoal is used as fertiliser in the fields – a use of every single item that is pretty typical. The single, terrifying thread joining all these industries from Western eyes was the complete lack of safety equipment of any sort. 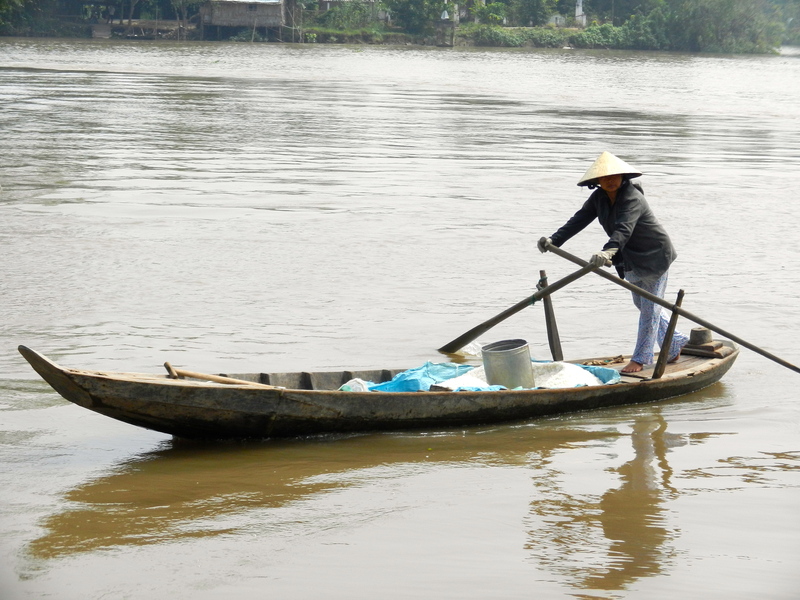 This part of Vietnam is known as the food bowl, it produces much of the country’s food. Perhaps because of this the fields are much larger than further North, and we even saw a sort of tractor in action. Our day’s riding, again about 60km, jumped between riding along tiny pathways beside canals and riding through these large fields. Our final ferry trip for the day, took us out to an island where we stayed in a family’s house. It’s a lovely house, with rammed earth floors and basic sleeping platforms. Although quite basic it was very comfortable. The kids had a fabulous time playing hide-and-seek, while the adults enjoyed yet another tasty meal. Here’s what I learnt today: You can’t take a picture of a pitch-black tunnel. But before we got to tunnels, there were other things. We’ve been having absolutely fabulous food on the trip, far better than we get at home. The quality and variety have just been amazing, and the kids have even been eating much more than just rice. But last night the boys really wanted pizza – so we went to a local, but Western influenced, cafe and had pizza and ice-cream for dinner. Smiles all round. 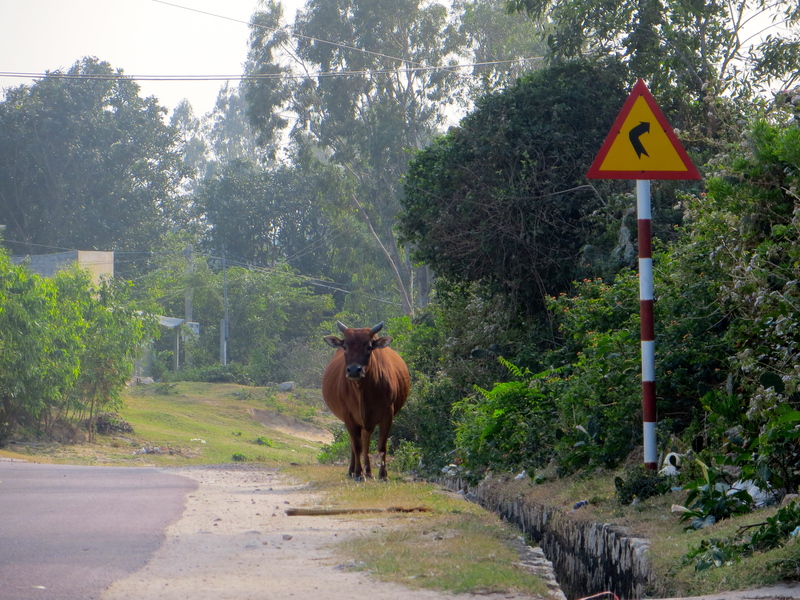 This morning we drove out of Ho Chi Minh City and into the surrounding countryside. 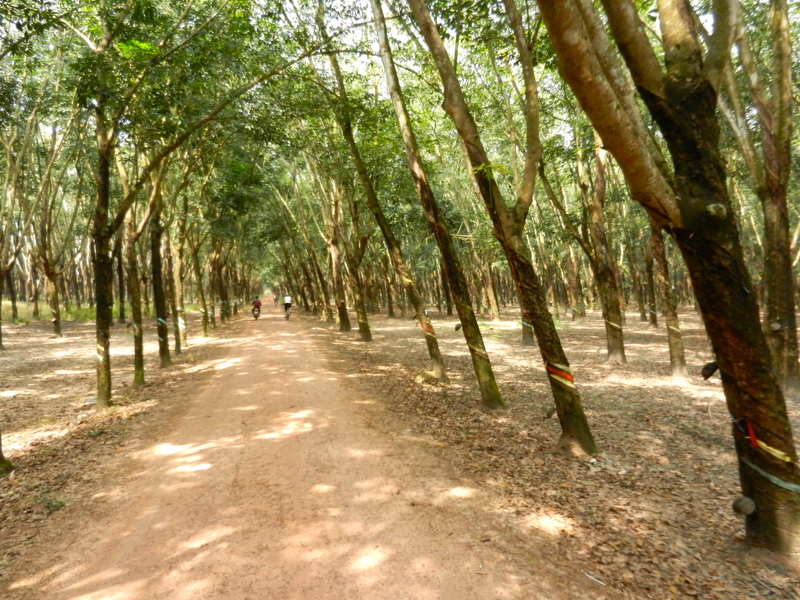 The farms here are much larger than up North and the area we rode around was dominated by forest and rubber plantations. Our guide says the different size is because there are fewer people in this area and so when the Government, which retains ownership of all land, distributes the plots each person gets more. But it’s obvious that each person in that area is also richer with some very big houses with massive iron gates, so there appears to be another dynamic going on as well – dachas for the ruling class perhaps. Having come South the weather has jumped up ten degrees and riding through the shade of the rubber plantations was gloriously cool and calm. A Cu Chi Tunnels entrance. 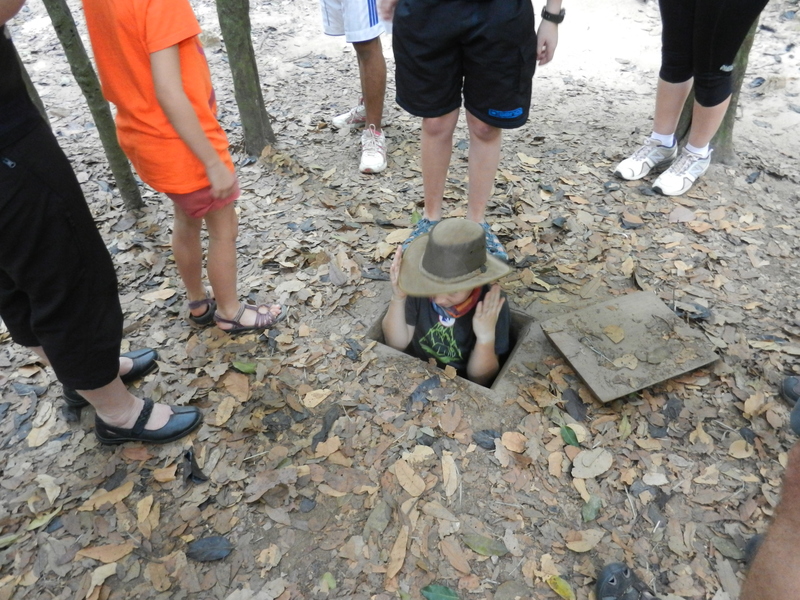 Our destination was the Cu Chi Tunnels – an amazing tunnel complex used by the Viet Cong during the War. When I’d heard about this in the past I’d assumed it ran for a few thousand meters; in fact the complex runs for 200 kilometres and was filled with rooms, kitchens, hospitals and so on. The tunnels are narrow and claustrophobic even in their current incarnation, which has seen them marginally widened to allow for tourist traffic. Originally they were made very tight so Americans would have problems fitting through spaces that were accessible to the smaller, leaner Vietnamese. We crawled through a variety of pitch black spaces which were made even more exciting by the bats flitting about. There were a couple of points which were dark and tight and airless enough to give a real sense of what it must have been like down there during the War. Lunch was on a pontoon by the river and, after the tunnels, the fresh air was invigorating. River boats passed us by. Like all the other boats we’ve seen, they are made entirely of wood and have eyes painted at the front to ward off evil spirits. Then after lunch we drove down still further South to the Mekong River which is where we’re spending the night in a small hotel. In the Cu Chi tunnels. Dec among the rubber trees. 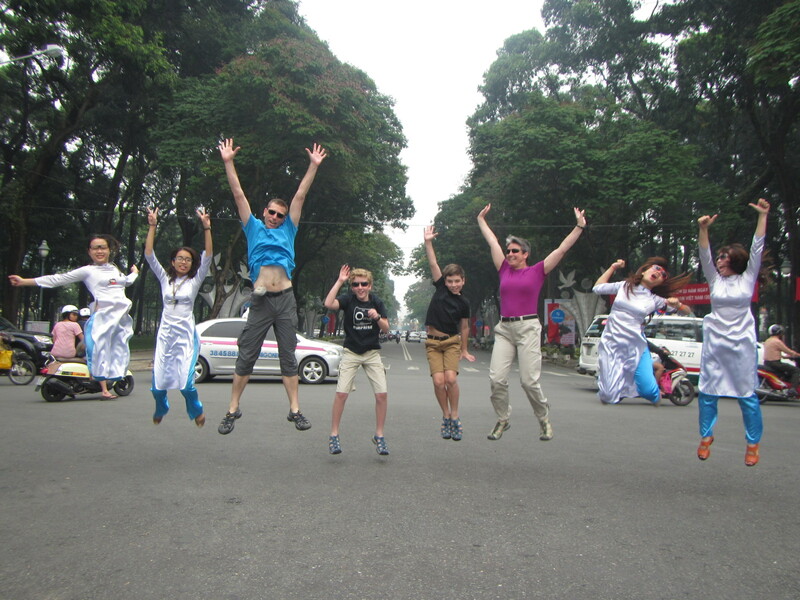 Jumping for joy in HCMC. Today was spent flying back South to Ho Chi Minh City, so a few reflections on what we’ve seen so far. 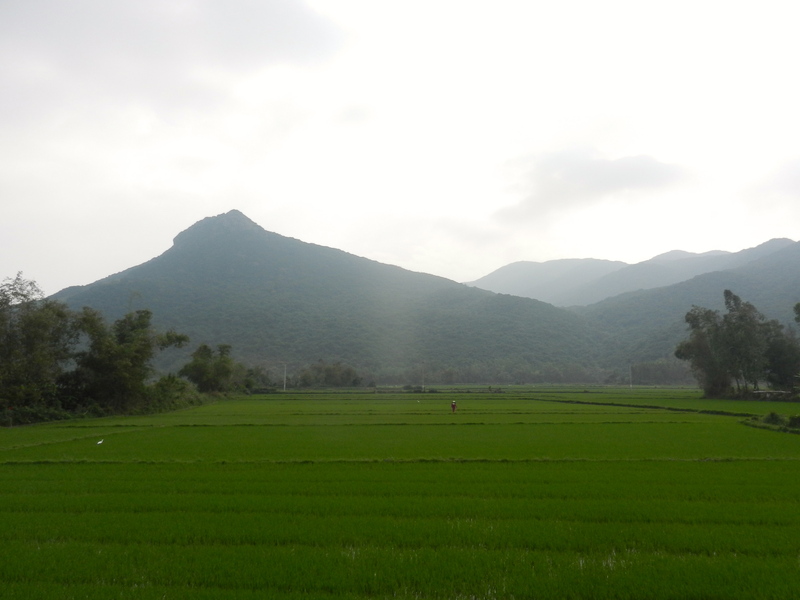 The rice fields are remarkably well-maintained. There’s not a weed in sight and every single rice stalk is carefully placed by hand to achieve the maximum density in the field. But then every neighbouring piece of fallow ground is covered in rubbish, often spilling from dumped bags. This strange dichotomy of pristine fields and horribly kept public spaces is almost the antithesis of socialism. The only conclusion we can come to is that maintaining the farms is such back-breaking work that there’s no enthusiasm or energy left for clearing the public areas. The roads are incredibly busy and chaotic, but yet feel so very safe. No one is going fast and so it’s easy to take evasive action; there is a strange, calm dance to manoeuvring through traffic which is quite beautiful in its way. In spite of the apparent chaos we’re feeling much safer in Vietnam than in Sydney, even in the cities. There’s clearly great poverty here sitting not far from increasing wealth. Out in the country people are living a basic, subsistence existence which is probably little changed over the last few centuries. But I’m writing this sitting by a rooftop pool and looking out at a modern skyscraper that would do London proud. 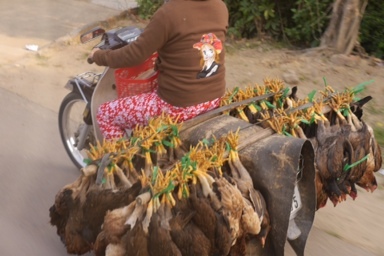 This morning we passed a motorcycle with a yoke out the back from which hung a couple of dozen live chickens. This afternoon a Rolls Royce swept past us and deposited its pristine owner outside the Bulgari store. While this does not apply only to Vietnam, there can be no greater general luxury in the World than the capacity to safely drink water from the tap. Vietnam ineffectively and intermittently blocks access to Facebook and WordPress. Overtly because of the danger of people being exposed to sexually explicit materials. It’s all particularly strange because they don’t block access to the Facebook mobile site. Vietnam is modernising, but remains a communist state. Every village we have visited has a welcome arch which details the village name and number. Each group of villages has one huge, well-maintained local government building – even when surrounded by decrepit shacks this will be a three-storey building made to a standard style. A people’s palace. The boys have had their photo taken by locals a lot. Everyone from workmen when we’ve stopped by the road to staff in the hotels to people on the airplane. I really want to find out what people do with these photos of themselves with complete strangers. We had cleaners in the hotel the other night chase us down the corridor to try to explain how handsome Callum is – you don’t get much curly blonde hair in the back-blocks of Vietnam. There has been a mildly disturbing amount of feeling how white and smooth their skin is as well. The boys have been largely good-natured about the whole thing, but being pawed by a stranger is a stretching cultural experience. Thus far Vietnam has entirely lived up to our expectations. It’s fascinating and exotic and the riding has been brilliant. The kids are having a great time and the other two families in our group are lovely. It’s actually quite amusing to find how similar the three families are in many ways – but then I guess there was always going to be a strong element of self-selection amongst a group that decided to go riding in Vietnam at Christmas. We chose Vietnam for a cycling holiday because it is flat. So a series of hills as we rode along the coast today came as a bit of a shock to the system. The day began with a three-hour bus trip South to avoid an unpleasant motorway section. Even that distance made an immediate difference to the countryside. Down this way the rice fields are green with growth rather than muddy in preparation for planting. The flat valley bottoms do not recede to the horizon, but are book-ended by rising hills. The people are just as happy to see us and wave at our passing. It was the tail-end of the morning’s ride that took us up the hills, and in all honesty they weren’t so bad. Basically we were riding along the coast and following the contours so there were three long sloping hills. Even though riding up them was a bit of an effort, riding down the other side when you could see for miles, and so be sure there was no traffic, was a sheer joy. It felt more like flying than riding. Down near the bottom though it did become apparent that traffic was not the only hazard when some of us had to make emergency manoeuvres to avoid wandering cows. The views from the coastal road were hazy but lovely. The China Sea is very rough, but there were fishing boats moored beyond the breakers. There are signs of it being Christmas day here in Vietnam but they are sparse and unusual. At one point on a back road I thought we’d seen a Christmas celebration. We were confronted by a convoy of open trucks filled with people waving flags and on the top of the second truck’s cabin sat an old, old man who looked like a cross between Santa Claus and Ho Chi Minh. It was only later that we found out that it was actually a funeral procession. I still don’t know what the old man was doing up there, although for a fleeting moment I did wonder if he was the deceased. The later part of the day involved a ride on a long bridge over a lagoon. In a rather surreal scene, there was a flock of concrete penguins making their way into the water beside the beginning of the bridge. 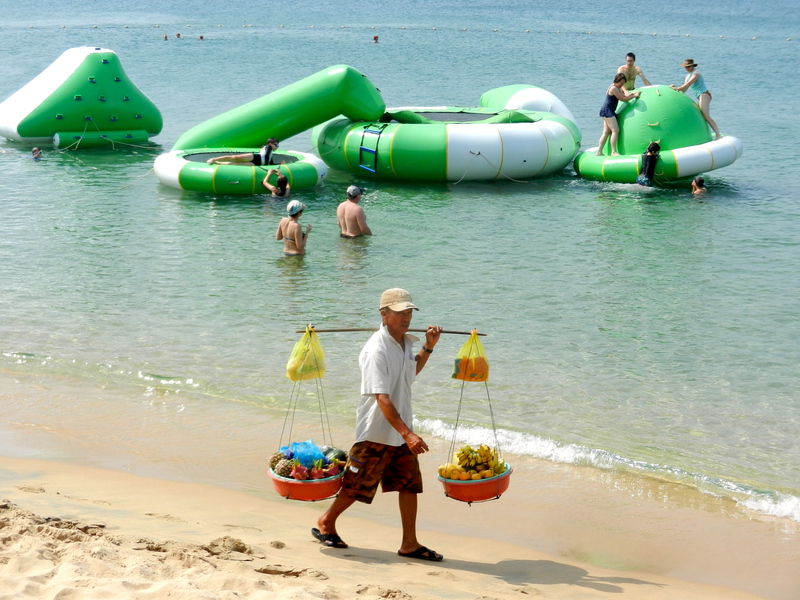 Finally we navigated the prodigiously busy streets of Quy Nhon to our hotel and a swim in the pool. Top of the first hill. Fishing boats in the S China Sea.